Each year, only two ASM International/SAMPE scholarships are awarded to students throughout northern California. This year, UC Merced junior John Misiaszek is one of them. Misiaszek conducts materials science and engineering research with Professor Yue (Jessica) Wang, and has received a scholarship from ASM International, the world’s preeminent materials information society and SAMPE, the Society for the Advancement of Material and Process Engineering, which provides enhanced educational opportunities. Selection is based on the applicant’s accomplishments, potential, and commitment to a career in the engineering of materials. This is the third award received by students in the Materials Science and Engineering (MSE) program at UC Merced. Previous awardees include David Pan (working with Professor Jennifer Lu ) and Matthew Robinson (working with Professor Valerie Leppert). Misiaszek’s work focuses on developing a 3D-printed 3D-printer that extrudes viscous paste at room temperature, which can be modified to suit different materials. This enables teaching labs at universities and high schools to explore novel materials applications. 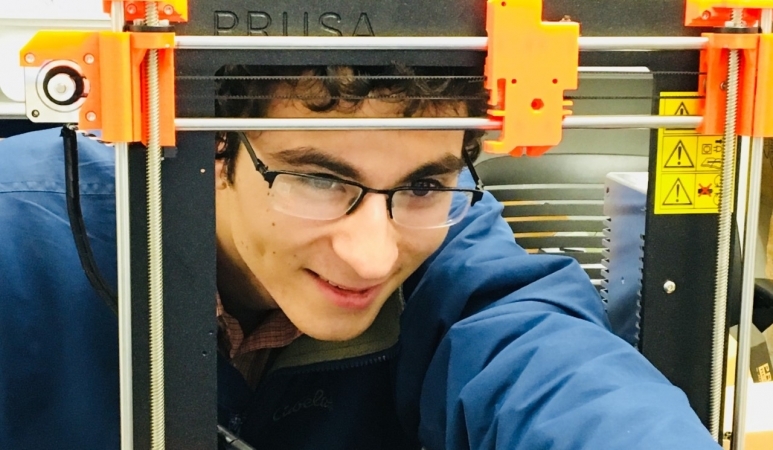 Using the scholarship and his achievements at UC Merced, Misiaszek plans to attend graduate school and earn a Ph.D. in materials science, continuing his concentration in 3D-printing or biomimetic research, eventually working at a national lab or at a research university as a scientist.